I finished this a few weeks ago. I wanted to test drive it a bit before I shared, quite literally. 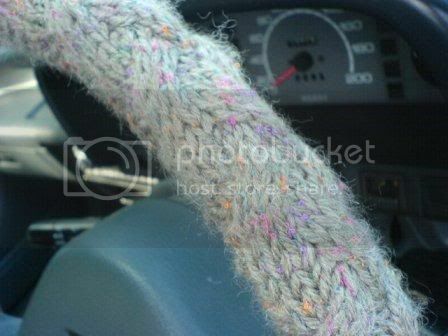 I knitted myself a steering wheel cover. I really do need one, it gets quite hot in my home town. I fell in love with the look of this cheapo tweed yarn. It is a wool blend from Lincraft (Aussie 'craft' chain store), because it looks great with my car seat covers. At first I was going to make a Wheelie from Knitty. But it just wasn't happening with this yarn, it is too thick (and not stretchy enough) to work with that pattern. So I started playing around with other designs. I decided a braided cable would look good, as I needed a long skinny panel (and cables are great for that). What do you all think? This is what it looked like before I sewed it on, so you can see the braids. I love the look of it, but it looks best from the passenger seat. When I'm driving the cables are really not visible. There is two more pics on my blog, if ya wanna see. http://missvicki.wordpress.com/2007/05/01/updates-all-round-with-pics-lots-of-pics/ ...scroll down a little. Miss_Vicki, that is freaking RAD! 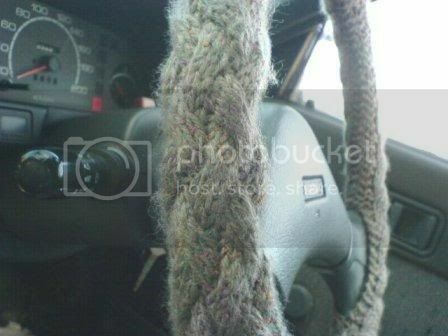 Not only do I want one, but I want it to be the dead of winter so that I can grab hold of it and thank Jebus for the warm, woolly steering wheel. That is awesome. 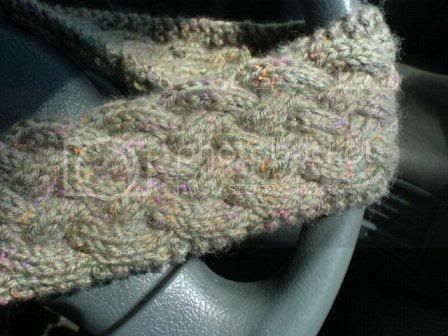 I have been wanting to make a steering wheel cover. Yours looks really great, and I think I am going to steal your idea. did I say one project at a time? This is really cool!!! I love it! I finally did it! I have a blog! That is fan-freaking-tastic! I have so much yarn in small quantities... I must make one. Would you be willing to post a tutorial? I LOVE this! I was going to make the fuzzy one from Knitty Gritty but I like this one so much more! Would you mind sharing the pattern with us? I bet this would be neat in a stretchy cotton, too. I'm already thinking of what yarns to use for mine! BTW, would it make my mini-van look cool? Look! You finished it! Way to go! I think it is just lovely, and think, this time last year you would have had no place to put it right? Or did I get that wrong. It's lovely! Good Job!